What Does a 20% Savings Rate Get You? Take a look at this hypothetical lawyer and his finances to see what a 20% savings rate really means to the average lawyer. Many lawyers are rightly confused about how much money they should be saving towards retirement each year. Knowing that almost all of us had a late start in earning money, there’s a general sense among the lawyers I talk to that we should be doing more. Any time I raise the topic, I’m almost routinely met by a response of “I’m not saving enough, am I?”. Unfortunately, simply believing that you’re not saving enough and wanting to “save more” isn’t a solid plan for righting the ship.”Saving more” isn’t an actionable goal. How will you know when you’ve reached it? Nor does walking around feeling like you’re not saving enough do much except make you depressed. What we all fail to recognize is that for better or worse we’re following a course right now, whether that’s a mapped out specific plan to a certain goal or a ship bobbing on the ocean subject to the currents. Therefore, I thought it’d be helpful to sketch out a few charts showing a hypothetical lawyer saving at hypothetical rates so we could see how long this lawyer will need to work in order to save for retirement. At the end of the day, saving a certain percentage of your income means you’ll have to work a fixed number of years. With some real numbers we can figure out what all this gets you. If you’ve wanted to know what saving 20% of your income will get you in life, look no further. Let’s assume our lawyer is a hypothetical 30-year-old with an income of $100,000 and a desired income in retirement of $100,000 as well. 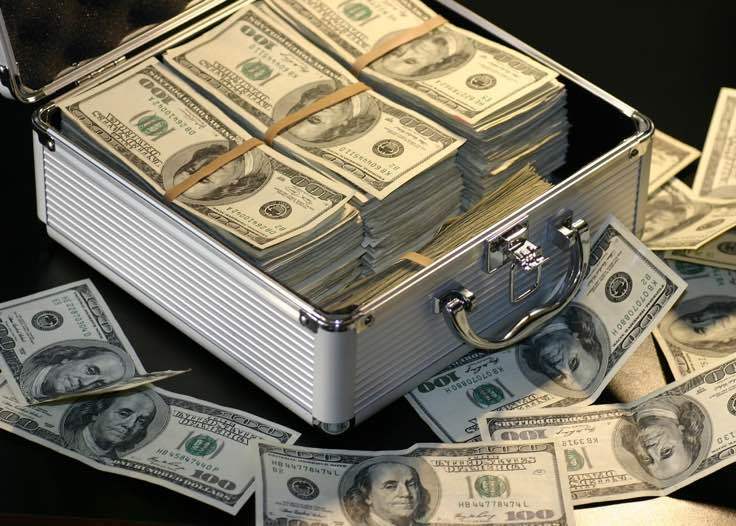 While it’s highly unlikely that any lawyer will need to replace their current income in retirement, it simplifies the math and calculations a bit to assume that this lawyer will also want an income of $100,000 in retirement. Remember that the numbers below are retirement savings, so don’t take into consideration other savings goals and payment obligations such as paying off student loans, saving up for a down payment and paying off a mortgage. All of those will need to be in addition to whatever you’re able to save for retirement. Depressing? Yes. But that’s how this works. You actually need to save up for your retirement, just like you’d save up for a down payment. How Many Years Do You Have To Work? Rather than making these calculations to see how much cash you’ll end up with, why not turn the question on its head to see long you’ll have to work in order to be able to retire? I find that more relevant. At what point in time can you stop working for money. Sure, you might keep working because you enjoy it, but here we’re looking at the moment in time that you can quit working and completely replace your income with the returns from your nest egg indefinitely (i.e. you’ll never need to work again for paid money). Here’s how long you’d have to work if you saved 5% of your income towards retirement. If you’re okay with working 54.7 years from today, you’re all set saving 5% towards retirement. Here’s how long you’d have to work if you saved 10% of your income towards retirement. Amazingly, this cuts out 11 years from your working career when you double your saving rate to 10%. Still, our hypothetical lawyer will be 73.4 after working for 43.4 years. How many people do you know that want to work until their early 70s? Here’s how long you’d have to work if you saved 15% of your income towards retirement. Our hypothetical lawyer would be 66.7 years old. This isn’t an early retirement by any stretch but perhaps the first reasonable number so far. Certainly many people do work into their mid-60s. If you plan to do that, you can get by with saving 15% of your income. 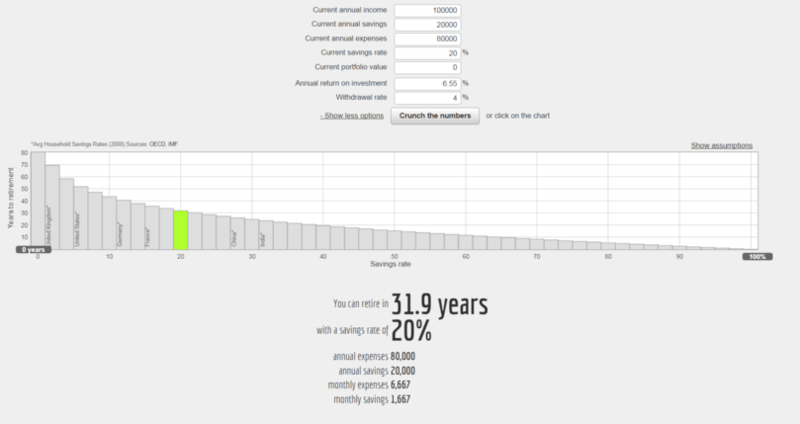 Here’s how long you’d have to work if you saved 20% of your income towards retirement. At a 20% savings rate, you’re now planning on retiring just shy of your 62nd birthday. I doubt many readers of this site will want to be retiring around then but now surely you see why 20% should be your floor savings rate! And if you can’t reach it right now, you should set up the systems so you’re saving as much as you can while you gradually increase your savings rate when you receive annual income increases, bonuses, etc. Of course the above numbers and calculations are hypothetical. Much better if you can play with your own numbers to see how much you need to save. I’ve built two calculators since I started the blog that are helpful for running your own numbers. 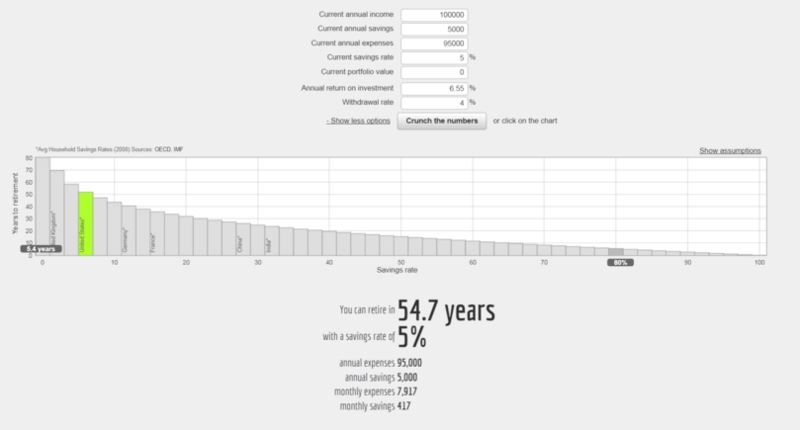 The first is a simple compound interest calculator. Enter your retirement savings and how much you expect to contribute each year to get a sense of the size of your nest egg after a certain number of years. The second is a slightly more advanced retirement calculator where you can figure out how many years you’ll need to work before you can retire. Enter the same numbers (current retirement savings, planned annual savings, etc.) plus a few other assumptions to determine how many more working years you’ll need to achieve the goal. Don’t forget that there’s two things missing from the above calculations that will likely help you out in the long run. First, you are highly unlikely to need to replace your current income in retirement. Retired people spend less. Second, Social Security exists despite the misguided millennial mindset that it won’t be around. As the most popular social program in history, it’s likely to continue existing for the foreseeable future. The above numbers do not take into consideration the added income you’ll receive from Social Security (if you don’t know how much you’ll receive, you can find your specific Social Security income here). Let’s talk about it. Are you on track to saving what you need for retirement? How to Achieve Ruthless PrioritizationWhere Do REITs Fit in a Portfolio? Two thoughts on What Does a 20% Savings Rate Get You? 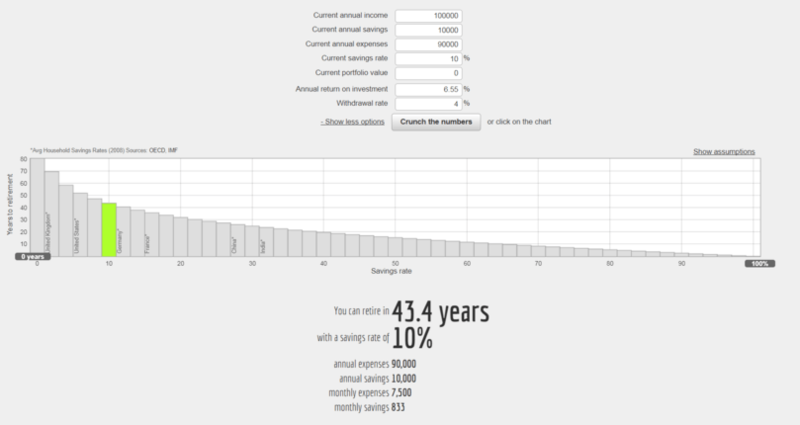 I found myself more in want of a tool to look at the different savings rates out of morbid curiousity. At the moment most calculations have us between 4-5 years from done. However the great thing it illustrates is also the power of starting early. In theory I could not save another dime and in 19 years we’d still be done. Won’t happen but it really illustrates the power of compounding. 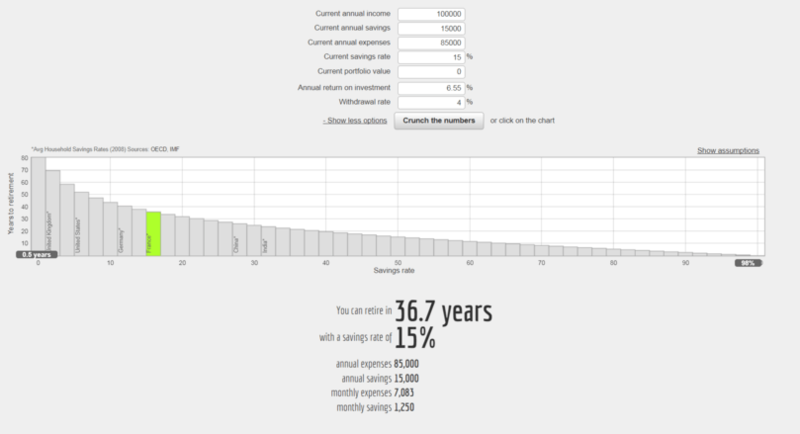 This is a great calculator to get an easy estimate! 1) The 4% withdrawal rate analysis does not include taxes on the money being withdrawn. 2) With regard to social security, you are right to mention it – and I agree that it is unlikely that the program as a whole is going to go away. However, I would submit that there is a significant risk that means-testing will be introduced sometime in the next 40 years. Again – there are fewer and fewer savers – so demand/dependence is increasing – and there are fewer workers proportionally – so supply/funding is also decreasing. We can’t predict the future, but we can look at how much additional income would be needed to be obtained from some source by the SSA – and what proportion of the current SSA-receivers would have to give up their benefits in order to fund the shortfall. Obviously this is speculative and depends on future events, but at $100K/year from investments, our hypothetical person would be well within the income range from which benefits might be taken if the shortfall is ameliorated by means-testing. The “misguided millennials” that you mention might not be so misguided. If anything, the mindset that I see from millennials is misguided in the “overly trusting” sense with regard to the government. However, typically legislators do not do what is morally right – they do what gets votes – and then justify it however they like. So if more voters would like the “fat cats” earning $100K/year to be cut out (“hey, they don’t need it anyway, am I right?”), then despite any previous promises to the contrary, our “pay as you go” SSA system will be changed.